SHANGHAI When Andrew Chi-chih Yao, a Princeton professor who is recognized as one of the United States's top computer scientists, was approached by Tsinghua University in Beijing last year to lead an advanced computer studies program, he did not hesitate. Why would a leading scientist at one of America's top universities leave a prestigious program for a university that is little known outside of China? One reason is loyalty to the country where he was born, although he spent his academic career in the United States and was raised in Taiwan. "Patriotism does have something to do with it, because I just cannot imagine going anywhere else, even if the conditions were equal," he said. China wants to transform its top universities into the world's best within a decade, and is spending billions of dollars to woo big-name scholars like Yao and to build first-class research laboratories. The effort is China's latest bid to raise its profile as a great power. 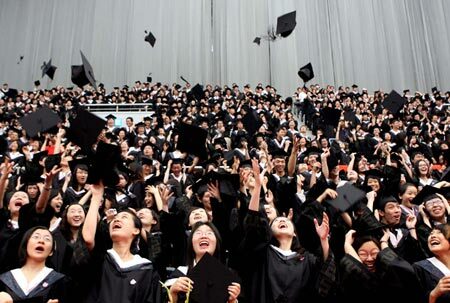 China has already pulled off one of the most remarkable expansions of education in modern times, increasing the number of undergraduates and people who hold doctoral degrees five fold in 10 years. "First-class universities increasingly reflect a nation's overall power," Wu Bangguo, China's second-ranking leader, said recently in a speech here marking the 100th anniversary of Fudan University, the country's first modern post-secondary institution. China's model is simple: recruit top foreign-trained Chinese and overseas-born ethnic Chinese to well-equipped labs, surround them with the brightest students and give them tremendous leeway. China is focusing on science and technology, areas that reflect the country's development needs, but also reflect the preferences of an authoritarian system that restricts free speech. The liberal arts often involve critical thinking about politics, economics and history. The government has placed relatively little emphasis on achieving world-class status in these subjects. Yet, many Chinese say – most often indirectly – that the limits on academic debate could hamper efforts to create world-class universities. "Right now, I don't think any university in China has an atmosphere comparable to the older Western universities – Harvard or Oxford – in terms of freedom of expression," said Lin Jianhua, the executive vice president of Peking University. "We are trying to give the students a better environment, but in order to do these things we need time. Not 10 years, but maybe one or two generations." Nonetheless, the new confidence about entering the world's educational elite is heard among politicians and university administrators, students and professors. Young Chinese visit the top campuses as if on a pilgrimage, posing for photographs before the arching stone gates they dream of entering as students. "Maybe in 20 years, MIT will be studying Tsinghua's example," says Rao Zihe, director of the Institute of Biophysics at Tsinghua University, an institution that is renowned for its sciences and is regarded by many as China's finest university. "How long it will take to catch up can't be predicted, but in some respects we are already better than the Harvards today." In only a generation, since 1978, China has roughly 20 percent of its college-age population in higher education, up from 1.4 percent. In engineering alone, it is producing 442,000 undergraduates a year, along with 48,000 graduates with master's degrees and 8,000 doctorates. But only Peking University and a few other top Chinese institutions have been internationally recognized as superior. Since 1998, when Jiang Zemin, then China's leader, officially started the effort to transform Chinese universities, state financing for higher education has more than doubled, reaching $10.4 billion in 2003, the last year for which an official figure is available. Xu Tian, a leading geneticist who was trained and still teaches at Yale, runs a laboratory at Fudan University that performs innovative work on the transposition of genes. On Aug. 12, his breakthrough research was featured on the cover of the prestigious journal, Cell, a first for a Chinese scientist. Peking University drew on the talents of Tian Gang, a leading mathematician from MIT, in setting up an international research center for advanced mathematics, among other high-level research centers. Officials at Peking University estimate that as much as 40 percent of its faculty was trained overseas, most often in the United States. The president of Yale University, Richard Levin, interviewed in Shanghai, where he was the featured guest in late September at Fudan's centennial celebration, also had high praise for China's students. "China has 20 percent of the world's population, and it is safe to say it has more than 20 percent of the world's best students," he said. "They have the raw talent." Levin also noted how China's low labor costs simplified the effort to upgrade. He said he had been astounded by the new laboratories at Shanghai Jiaotong University, the city's second-most prestigious university, which he said could be built in China for $50 a square foot, or 0.09 square meters, compared with $500 a square foot at Yale. Some critics say that the country is trying to achieve excellence in too many areas at once, and that the plans of about 30 universities selected for heavy state investment have far too little differentiation, wasting money on duplication and sacrificing excellence. Even Levin tempered his enthusiasm with a warning that the "top schools have expanded much too fast and are diluting quality." In many cases, however, the toughest criticism comes from people who have worked in the system. "It is important for different universities to have different qualities, just like a symphony," said Yang Fujia, a nuclear physicist and former president of Fudan University. "But all Chinese universities want to be comprehensive. Everybody wants to be the piano, having a medical school and lots of graduate students." Yang, who now leads a small experimental university in Ningbo, founded with the help of the University of Nottingham, also criticized the lack of autonomy given to many Chinese researchers. "At Princeton, one mathematician spent nine years without publishing a paper, and then solved a problem that had been around for 360 years," he added, a reference to Andrew Wiles and his solution to Fermat's Last Theorem in the early 1990s. "No one minded that because they appreciate the dedication to hard work there. We don't have that spirit yet in China." Similarly, Ge Jianxiong, a distinguished historical geographer at Fudan, said Chinese culture often demands speedy results, which can undermine research. "In China, projects are always short-term, say three years," he said. "Then they want you to produce a book, a voluminous book. In real research, you've got to give people the freedom to produce good results, and not just the results they want." Ge added that education suffers here because "it has always been regarded as a tool of politics." Yao said he had expected to concentrate on creating a world-class Ph.D. program, but had found surprising weaknesses in undergraduate training and had decided to teach at that level. "You can't just say I'll only do the cutting-edge stuff; that's not a workable solution," he said. "You've got to teach the basics really well first." But the biggest weakness, many Chinese academics indicated, is the lack of academic freedom. Yang, the former president of Fudan, warned that if the right "atmosphere" was not cultivated, great thinkers from overseas might come to China for a year or two only to leave, frustrated. Gong Ke, a vice president of Tsinghua University, said universities had "the duty to guarantee academic freedom." "We have professors who teach here, foreigners, who teach very differently from the Chinese government's point of view," he added. "Some of them really criticize the economic policy of China." Li Ao, a well-known Taiwanese writer, called for greater academic freedom and independence from the government in a September speech at Peking University. The next day, after reportedly coming under heavy official pressure, he delivered a far tamer version of the speech at Tsinghua University, where media coverage was tightly controlled. The Chinese government also censors university online bulletin boards and discussion groups, and recently prevented students at Zhongshan University in Guangzhou from conversing freely with visiting elected officials from Hong Kong. Students here are not encouraged to challenge authority or received wisdom. For some, this helps explain why China has never won a Nobel Prize in any category. What is needed most now, some of China's best scholars say, are bold, original thinkers. The greatest thing China has done in the past 20 years is to lift more than 200 million people out of poverty, Xu said. "What China has not realized yet, though, if it truly wants to go to the next level, is to understand that numbers are not enough. "We need a new revolution to get us away from a culture that prizes becoming government officials. We must learn to reward real innovation, independent thought and genuine scholarly work."